I'm actually staring 14 weeks post relaxer in the face (in just a matter of days) and can't believe I've made it this far into a stretch. What's more unbelievable, to me, is that I have no plans of relaxing soon nor of transitioning to natural at the moment. I plain and simple just have not been and am still not in the mood to relax my hair. I just do not feel like it! It's so weird because I'm usually quite eager to relax by the time I make it to 12 weeks post. My last wash day, which I will detail in another post, made me seriously consider relaxing soon. Tangles and shedding galore! That is one of the usual motivations for my eagerness to relax. A certain amount of new growth throws my wash days all the way off. 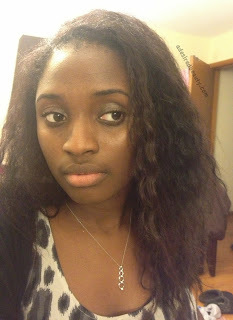 I have had this dilemma in my mind for a month or so about what long term protective style I would like to try out. I tried out a quickweave wig (pictured above) to decide if I wanted to go for wigs for awhile. I think I would enjoy the ease of wearing wigs, but I would also have to invest in some good hair or a good unit if I was going to be wearing it long-term. I can't walk around looking all matted within two weeks. So, I think I'm going to save up a little for that investment. Perhaps at the beginning of the new year I'll go for that. In the meantime, I decided to get box braids. After much deliberation! A number of people I have talked to about getting them doubt my ability to keep them in long term. Ha! Because they know how bored I get with hairstyles and how much I enjoy washing my hair weekly, both of which may work against me during this time. For me, if I can keep them in for 4-6 weeks, I will be proud. Plus the price is extra motivation for them not to come out after a few short weeks. That might not seem like very long-term to some people, but it definitely will be to me. This is a reason (besides not feeling like it) that I didn't want to relax as scheduled. Putting braids in after a fresh relaxer would set me up for failure I'm sure. I am itching to buy some new hair products! I probably don't actually need any of the things I want to buy, but that's nothing new. I'm just trying to hold out until Black Friday so I can get some goodies from online companies. I got some great products during the sales last year, and haven't repurchased any since. Some of them I will be repurchasing, some of them I won't, and some of them I haven't even used up yet. Shame on me and I'm talking about buying some more already. My hair is inching toward full bra strap length pretty quickly, in my opinion. That was my original hair goal. I changed it to mid-back length because I want to cut some nice layers in it for my dream hair and think that will ensure I'm still around the same area after the cut. I was so very tempted to have my stylist go ahead and cut into my hair right now though! My one-length hair kinda bores me when its straight, but not when its textured. 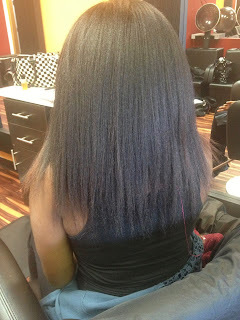 After watching another stylist cut and feather a woman's hair so beautifully, I thought about just going for it. My stylist kindly reminded me that that woman's hair was weave and mine is not, and I should just keep growing until I get to my goal. Thank God for her! I would have regretted that cut for sure. Hope everyone has been well. I am going to start blog stalking soon! Lovely results from the salon visit! I had a dream where I relaxed my hair last night. I was frightened. I was like, there is no going back! what am I going to do? I do think about relaxing my hair sometimes. My 4c hair kills me:-) 14 weeks is a long time. You can keep going if your hair is not breaking. Nice growth. Oh my Nerline! That sounds like a dream I had where I somehow forgot to neutralize and my hair fell out! Lol so scary until you wake up and realize your hair's fine :) thanks for sharing! I'm sure I have type 4 hair, too, which is why going natural makes me nervous. I'm going to try to make it thru December tho. Heaven is rejoicing for their new angel---It's completely understandable that you didn't post. You owe your followers no explanation chica! Your family is totally more important than adesiredbeauty. I second that! My condolences to you and your family at this time Melanie. That's so sweet KLP! Thank both you and you, Andrea. :) I totally agree, family first. It was just the pure significance of the loss that made it worth mentioning for me. Couldn't just start again without acknowledging it, if you know what I mean. Thanks for following along with me, too! My Condolences for your loss. 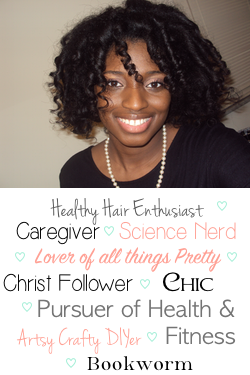 Your hair looks amazing, so thick and healthy!